The midi-1050 is part of the LEDdrive range from Mode Lighting is part of our extensive range of LED drivers. It is a mains dimmable constant current power supply unit designed to drive high brightness LEDs. • 700mA and 1050mA constant current outputs. • Short circuit and open circuit protection. • High efficiency which ensures a cool operating temperature. • Flame retardant moulded enclosure, UL94-V0. • Compact size suitable for Ø 70mm cut-out. • CE Compliant to EC EMC and Low Voltage directives. • Complies with EMC harmonics standard, voltage fluctuation standard, emission standard and immunity standard. Complies with EN 61347-2-13 electrical safety standard. Low audible noise throughout the dimming range. 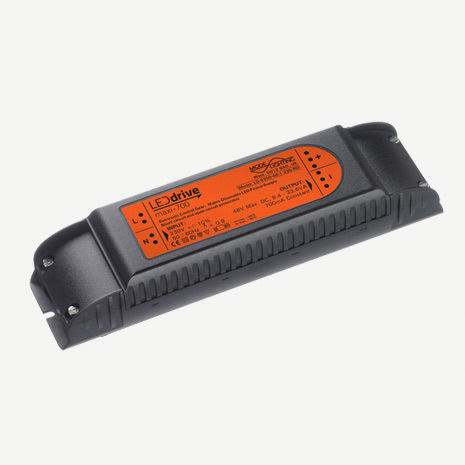 All LEDdrive power supplies are dimmable by both leading and trailing edge dimmers (subject to a minimum load). The midi range provides a constant current of both 700mA and 1000mA with a series output voltage of 18V to 48V.